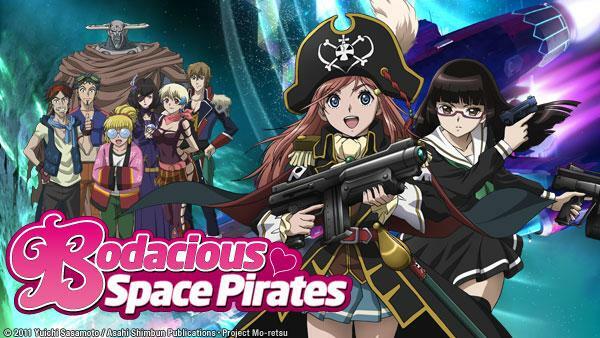 Sign up now to stream Bodacious Space Pirates, subs, tons of dubs, OVA's, simulcasts, plus the all new Dubcast℠ editions and more! Marika's living the space life with yacht club at school and part-time work at Cafe Lamp. However, her world changes when she's thrown into the role of Space Pirate Captain. Marika becomes worried about her decision to take the helm of Benten Maru as Captain, and she wonders whether the pirate life is what she wants. The voyage through the Tau Ceti system proves more difficult than the crew expected when their communications are suddenly jammed by an unknown source. The E-Battle has begun! The Odette II and Mystery Ship #1 throw down, but Marika has a plan to give her side the winning edge. After much deliberation, Marika has finally decided to take up the mantle of Pirate Captain, and she has 50 days to engage and plunder, or she's out! Marika finds it hard to juggle pirating and schoolwork, and her grades begin to suffer. A rush job is just what the crew needs to solve their cash flow problems. A stowaway has been discovered aboard the Bentenmaru and is in search of Kato for a favor. As simple as a small favor sounds, Marika and her crew are stumped. The Bentanmaru watches helplessly as the info ship is attacked by its own. The Princess may be able to get Marika and her crew the information they desperately need. The search continues for the golden ghost ship, with Chiaki filling in. Warships suddenly appear during rough weather, and only the Princess can prevent the coming battle. The Bentenmaru is severely outnumbered, 1 ship to 7. With everyone gearing up for battle, a sudden space rift reveals the prize that everyone seeks! It's a mad dash for the crews of the Bentenmaru and Serenity Fleet with the ghost ship treasure as the finish line. Serenity royalty seems to be over until Gurier and her sister show up at the Academy. Now with a new role to pursue as a mentor, Marika's back to the balancing act. Infected cat-monkeys have put the crew of the Bentenmaru under quarantine. With her mates out for a month, Marika begins seeking out some new "employees." E15 | Smuggling, leaving port, and a big jump! Marika has finally assembled her crew, but teaching them the inner workings of running the Bentenmaru will prove difficult. The yacht club members have taken to their roles aboard the Bentenmaru. All is well until Marika announces that it's time to do a little looting! Being a pirate carries certain risks, something that Marika is acutely aware of. When a certain job involves kidnapping, Marika becomes worried. Jenny has found herself as the new client of the Bentenmaru crew. The new plan is to make their way to her fiance's ship to make a deal. The real Bentenmaru crew will be tasting fresh air soon with their impending release. Marika tidies up the ship, but the job proves to be more than she can handle. The yacht club is planning to enter the Nebula Club race, a competition that their school has been banned from for the past 5 years. When the girls of the Bentenmaru register for the Nebula Club, the other contestants are wary of their participation. An unknown assailant begins destroying pirate ships and their crews! With twenty days until her pirate license expires, Marika pulls out all the stops to protect her ship. Grand Cross, the pirate hunting ship, and the Parabellum share a mysterious connection that Marika aims to uncover. With the battle against the Grand Cross warship, and Marika's secret plans for the pirate council, it's as exciting as it is dangerous to be a pirate! Mysteries abound at the Pirate Council. Where is the REAL Luca? What is Kayne hiding? Most importantly: is Ironbeard friend or foe? The final showdown is here: Marika vs. Quartz in an all out grudge match to claim ALL the booty. An unexpected third challenger appears, adding fuel to the fire.